One Thousand Birds - the 3rd album by GRICE will be released on 22 March 2019 on artrock label hungersleep records. The 13-track album is now abailable to pre-order from Burning Shed and Bandcamp. The first Single Hardest to Reach will be released on 22 February. The second Single Steam is due to be released on 15 March 2019. GRICE returns from Forward Studios (Rome) to mix and master his forthcoming album 'one thousand birds'. The album is due to be released in Spring 2019. Grice records his forthecoming solo album 'one thousand birds' at Forward Studios. An intensive week of recording drums, Hammond organ, electric piano and grand piano along with electric and acoustic guitar parts will augment the songs previously tracked at Sound Gallery Studios. [All Angels] the long-awaited live GRICE album recorded at St Michael's & All Angels Church is released on 25 May 2018, featuring an exclusive live performance of 'Frozen Water' from the album Alexandrine. The live performance was recorded (straight off the desk) in the glorious atmospheric space of St Michael's & All Angels Church in Exeter and is a sonic snapshot of a unique line up of musicians, including Luca Calabrese (trumpet), Fred Ehresmann (piano, keys, organ), Bel Ehresmann (bass and double bass) and Duncan Chave (Eigenharp and programming). The release also includes 3 tracks recorded from the Alexandrine album launch, and the premiere performance of 'Clear, Conscious & Free'. Available from Bandcamp. The Grey of Granite Stone 5-track EP described as 'a vast edifice of warm, beautiful shapes, features 'happy-sad opener' Change my World and Cry 'a lapping of waves reminiscent of Alexandrine' (Chris Robers, PROG magazine). 'Change my World' is included in the accompanying CD of PROG magazine (May edition, 2018). Available to buy in CD format and as a digital download from Bandcamp, Burning Shed, iTunes. The full Refractions release by GRICEset for February 2017 - is a collection of alexandrine remixes and tracks that never made it onto the album and will feature re-imagined tracks by Richard Barbieri, Beloved Aunt and Clogmill. GRICE has signed with Sylvia Bell Music Management (Germany). Sylvia came to see GRICE and the band play live in Berlin and it became immediately apparent that their sonic worlds resounded! Sylvia made her mark in the music industry when given the chance to set up Virgin Hamburg and has since then worked with high profile artists such as Lenny Kravitz, the Rolling Stones, Simple Minds, Smashing Pumpkins, Genesis, Placebo, Iggy Pop, Skunk Anansie and many more. The track Eclipse from Alexandrine was included on PROG (66) magazine covermount CD. Propeller 5.1 - The full album Propeller has been mixed for surround sound (5.1) and mastered by Simon Heyworth & Andy Miles at Super Audio Mastering for release this year. The mix builds on the already spacial stereo mix and production by Lee Fletcher and will provide an enhanced listening experience. Playback event at the new solar cinema [Studio 74] at Exeter Phoenix and other select spaces coming soon. Best of 2015 - Our friends at Xymphonia Radio have listed Alexandrine at No: 9 in the 'Best of albums 2015' - we salute you. 17 December 2015: UK Alexandrine album launch at Exeter Phoenix. October 2015: GRICE and his band return from a whirlwind visit to Berlin - GRICE delivered a masterclass and short performance at dBs Music in the Friedrichshain quarter of Berlin to a packed house of students ahead of an exclusive gig at Berlin's Culture Container. It was an enjoyable week in a wonderful city rich with music and opportunity. There was also an inspirational visit to the legendary Funkhaus recording complex. We are making plans to return and makemore music in Europe. Live footage from both events will be available soon online. Musician, composer and producer Steve Jansen has mixed the second album Alexandrine. Steve is well known for his exceptional work with Japan, Rain Tree Crow and is also a remarkable solo artist in his own right. Brother to David Sylvian and long-time musical collaborator with Richard Barbieri (who also plays and co-produces tracks on Alexandrine), Steve is lending his sonic genius to Alexandrine. 22 June 2015:Alexandrine album release, featuring Richard Barbieri (Japan, Porcupine Tree) and mixed by Steve Jansen (Japan). July 2015: signs distribution contract in Benelux with Freia Music, Netherlands. September 2015: Frozen Water from the album Propeller (featuring Richard Barbieri) is featured on the covermount CD of Classic Rock presents Prog. GRICE performs Live @ IB Expo 2013 with Hogarth & Barbieri November 2013: Grice is invited by Richard Barbieri at the IB Expo in Sweden, where he makes an impromptu stage appearance and sings with Steve Hogarth (Marillion) on a premier performance of the track 'Naked' from the album Not The Weapon but the Hand by Richard Barbieri & Steve Hogarth, alongside guitarist David Torn and Julie Slick on bass. March 2012: releases his debut album Propeller, featuring Raphael Ravenscroft (Baker street, Pink Floyd), Markus Reuter (StickMen) and freeform trumpet player Luca Calabrese (Ray Charles, Keith Tippett). The album was produced by Grice and award winning producer Lee Fletcher (Unsung Productions) and was mastered by Simon Heyworth (Tubular Bells). August 2013: Highly Strung from the album Propeller is featured on the covermount CD of Classic Rock presents Prog. 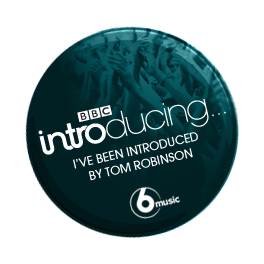 August 2013: Highly Strung (Richard Barbieri Remix) by GRICE is selected and played by Tom Robinson on his acclaimed BBC Introducing MIXTAPE Radio Show on BBC 6 Music. December 2013: Propeller gets shortlisted in the UK album of the year category at the MPG Awards. March 2014: In recognition of his achievements in providing opportunities for young musicians as Sound Gallery's Creative Director, Grice is invited to become a Fellow of the Royal Society of Arts. September 2014: GRICE and his band appear on the same bill as Public Service Broadcasting and Baka Beyond at Oktoberfest, Exeter. GRICE take off with a live session recorded and filmed at Sound Gallery Studios available on-line HERE. GRICE live in-session on BBC Radio Devon on the John Govier show - Grice and his band (Al Swainger, Duncan Chave, 05Ric & Jim Peters) performed tracks live from the album Propeller, chatted and ate cakes (not necessarily in that order) with John Govier (9.2.2013). Work continues on the live GRICE set at various top secret locations, air-bases, studios, art centres, vinyl shops and galleries around the country. Musicians so far drafted to join Group Captain GRICE for the second tour of duty include Flying Officer Al Swainger on double and electric bass, Flight Lieutenant Duncan Chave on loops and triggers and all things technical, new guest musicians to be announced. Live performances at Exeter Phoenix - Bristol, London and a couple of European dates are also planned. We will post some live session audio clips and snippets shortly...over...and out. ©2019 GRICE - All rights reserved.